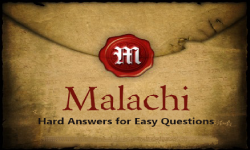 As God's final spokesman of the Old Testament, Malachi comes to the people of God to call them out for their lackadaisical commitment to God, and to call them back to a vibrant and living relationship with Him. He's a no nonsense prophet who enjoys sarcasm, but his message cuts to the bone. We are going to meet this "messenger" and delve deeply into God's answers to seven questions His people had for Him.